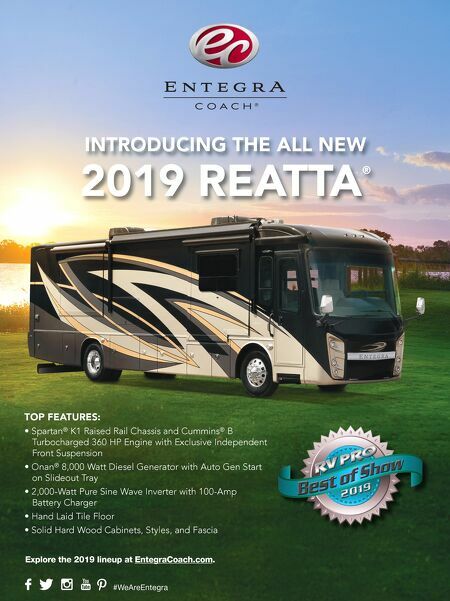 16 • RV PRO • November 2018 rv-pro.com O P E N H O U S E C O V E R A G E Entegra Reatta 39BH It's hard to look at the well-appointed Entegra Reatta with its $327,000 MSRP and think of an entry-level vehicle, but it may be as close as Entegra has to that level among its diesel pushers. Built on a Spartan K1 Raised Rail Chassis with independent front suspension, Reatta is powered by a 360-horsepower Cummins engine. "We have a Class C plant, a Class A gas plant, and a diesel plant – and the diesel plant builds luxury units only," says Brion Brady, general manager of Entegra Coach. "This is built on that line, so therefore, we are the only one building an ISB on a luxury line where all they build are diesel pushers." Although the drive train may set Reatta apart, the living quarters are what will make the sale for the buyer looking for the right motorhome. Polished tile floors give an immediate touch of class. Solid hardwood throughout the coach also makes it feel like a true luxury vehicle. The kitchen features a Furrion induction cooktop and residen- tial refrigerator as well as plenty of pantry space and counter space. In the 39BH, a hide-a-bed sofa or optional theater seating is arranged across from a TV that is placed on a lifter so that it can be lowered out of sight for watching nature out the window. The large kitchen sits in front of a half-bath and room with power bunk beds. The rear bedroom features a tilting king bed, wardrobe and 32-inch TV on a lifter as well. In the rear of the coach is a huge full bath with a washer-dryer option. On the outside, an entertainment center and extensive full pass- through storage areas give plenty of places to watch TV and store things. The storage areas include slide-out trays. Other highlights include an Onan 8,000-watt diesel generator with auto-gen start on one of those slide-out trays. There also is a 2,000-watt pure sine wave inverter with 100-amp battery charger. "Price-wise, we'll call it entry level, but it would be the top of that entry level," Brady says. "But in our minds, we can't cheapen these up too much. There is a price point at which you skimp and don't have the quality and you can see it. It makes a world of difference." 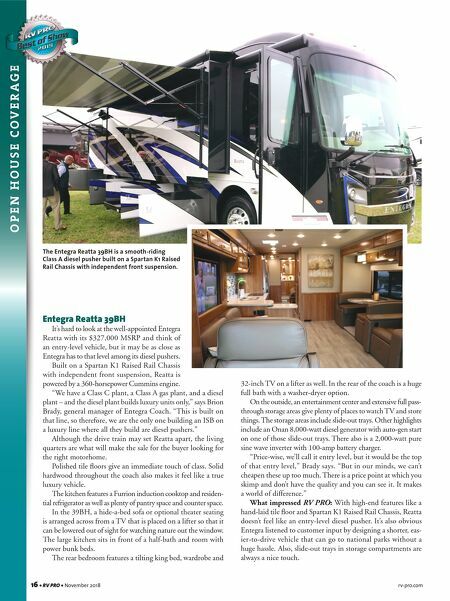 What impressed RV PRO: With high-end features like a hand-laid tile floor and Spartan K1 Raised Rail Chassis, Reatta doesn't feel like an entry-level diesel pusher. It's also obvious Entegra listened to customer input by designing a shorter, eas- ier-to-drive vehicle that can go to national parks without a huge hassle. Also, slide-out trays in storage compartments are always a nice touch. The Entegra Reatta 39BH is a smooth-riding Class A diesel pusher built on a Spartan K1 Raised Rail Chassis with independent front suspension.